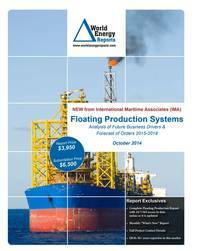 The November WER report identifies and updates details for 244 floater projects in the planning stage, 74 production or storage floaters currently on order, 258 oil/gas floating production units and 13 floating regas units currently in service and 25 production floaters off field and looking for redeployment contracts. Information is current as of 25 November. Also in the report is a recap of activity over the past month and an analysis of the impact of the Petrobras implosion and oil price downturn on near term demand for new equipment.